Co-Founder & Co-Owner of CrossFit NYC, world's largest CrossFit gym. Clients are thoroughly trained using the CrossFit methodology, as well as other approaches, assessments, and disciplines as deemed necessary. Exercises and workouts are scaled appropriately, relative to each athlete's fitness and injury history. Court Wing is the Co-Founder & Co-Owner of CrossFit NYC, the largest CrossFit affiliate in the world, as well as New York City's oldest and largest. Court was also New York's first certified CrossFit Instructor, receiving his Level 1 Trainer certification in July, 2004, after training for a year at CrossFit North in Seattle, the world's first CrossFit affiliate. Past clients have included US astronauts, professional athletes, media leaders, SEALs, MIL/LEO/FR, heads of state, as well as thousands of New York professionals, all seeking to achieve their best fitness. 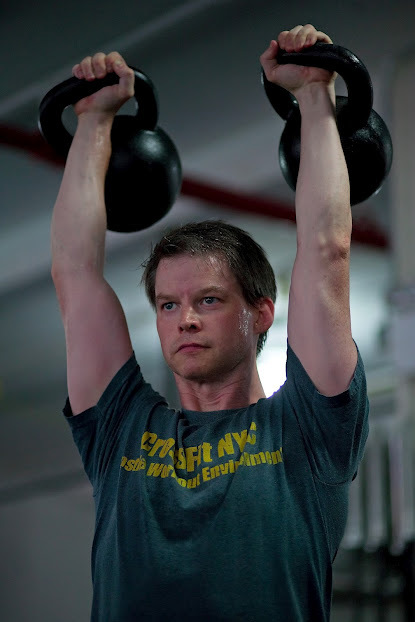 As the first CrossFit Level 1 trainer in NYC, Court was a leading pioneer in establishing CrossFit on the East Coast, and has received multiple specialty certifications within CrossFit, as well as other fitness organizations, including training with barbells, Olympic lifting, and bodyweight/gymnastics. He was the chief designer of the fitness preparation course for the United Nations Close Protection Diplomatic Security. Regardless of the implement or program, he can help you to find your best approach to strength training. While using all his disciplines in order to achieve the best results in conditioning, Court is known for his zeal for kettlebells and was rated as one of the "Top 10" kettlebell instructors in "Hardstyle Magazine". He has received certifications in kettlebell training through several organizations, including Strong First, RKC, IKFF (w/Steve Cotter), CrossFit (w/Jeff Martone), and served as an assistant instructor at a closed certification for the US Navy SEALs in Damneck, VA (at the direct request of Pavel Tsatsouline). Let him show you the phenomenal results you can achieve with one simple tool. As New York's first certified Z-Health instructor, Court has earned the designation of Master Trainer, demonstrating the full knowledge in applying dynamic joint mobility, visual, and vestibular retraining for improving performance, ending pain, and helping athletes rehabilitate themselves from chronic injuries and movement restrictions. Clients have been able to avoid surgery as a direct result of his training. Find and eradicate the restrictions limiting your performance and enjoyment of movement. One his rehab clients was featured in USA Today, who was able to train for and achieve a 10 mile open water swim just three months after cancer surgery.